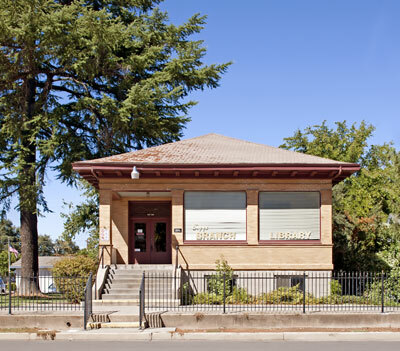 When the Carnegie grant of $5000 was offered in 1906, Biggs may have been the smallest city to undertake the responsibility of a library grant. There was no previous library in Biggs which had incorporated just three years prior to the request and estimated its population as 700. Architect A.J. Bryan of Chico designed the building and builders were Huxtable and Losser. Construction was delayed by the high cost of labor following the "San Francisco fire and railroad congestion" after the 1906 earthquake. As completed a recessed front porch extended across the front of the building but it has been glassed in except for a small entrance porch. The building still houses a Biggs Branch Library.